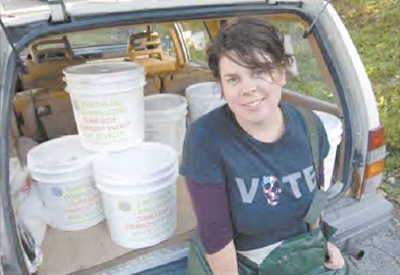 Meet the brains and muscle behind Earthgirl Composting. She's Megan Kolbay, a mother, gardener, and entrepreneur. "My passion for the environment began in 1997 during a cross-country road trip. My friend's mindfulness about the environment was an eye-opener. I suddenly felt I had been living in a bubble for 25 years, with no awareness of how everything we do affects everything else. And so began my quest to live in a way that respects the earth and all its inhabitants. Since then, I have been committed to making a difference not only in my own life, but in others' as well. When I was offered money in exchange for bringing food waste to be composted along with my own, I realized there was a niche to be filled. As a single mother, it occurred to me that I could support myself and my son, carpool food waste and raise awareness about the importance of diverting the waste from the landfill by composting it." Megan thought, "I can do this!" And she did. On Earth Day in 2006, Earthgirl Composting made its debut. Megan and her son live in Montpelier working towards a life of self-reliance and sustainability.